As a freelancer, you get to choose whom you work with. As such if a customer is being ‘difficult’ or ‘troublesome’ the ultimate response is not to work with them. This is relatively easy to do before you start working with the customer. When you meet them, prior to issuing a proposal, you have to make a judgement on whether you can work with them. Is there a fit in terms of personality, working style and values? If not, one has a few options. You can just explain your view of the situation. You can also say that you don’t have time to work with a particular client due to other commitments. Another option is to quote an above market price – at which point the potential customer will probably walk away. You could also refer such clients to other providers who may be more cost effective. At this pre-contract stage, I will make a judgement on how likely ‘success’ can be achieved for the client. I like to work with clients where there is at least a 90% chance that value can be delivered. This is essentially a judgement call on the core strength of their project or business. If their business has real merit, it a lot easier for me to achieve the desire result and ultimately get paid for my work. 1 – A Customer who does not pay on time. Equally difficult are clients who do not provide a PO on time. Your invoice is delayed. As a consequence your payment is later than it should be. 2 – A Customer who does not engage fully. Clients who think that they are right all the time in spite of evidence to the contrary. If they are unwilling to take other views and feedback on board, I consider this to be the most damaging because it is the core value provided. It is a sign that they don’t value your contribution. As such you are wasting your time and theirs. Ultimately, one runs the risk of not getting paid – I seem to keep coming back to that one! Please feel free at this stage to take some time to create your own list of Difficult customer situations. My list is quiet mild – and doesn’t refer to the potential for customers to behave unreasonably such as acting in a rude and ignorant fashion or worse people who become aggressive and abusive. My general outlook is that people are good by nature. I think that as such there is no such thing as ‘troublesome customers’ rather people who are facing a difficult situation and don’t really know how to react. It is my job to figure out how to make sure that the customer is better off AFTER * dealing with me. If the client did not have an issue or a frustration you would not be there. As such it is your job to provide a solution. The task is to alleviate both the technical or functional issue and the emotional frustration. For instance, I have worked with many clients to assist them to develop financial projections. 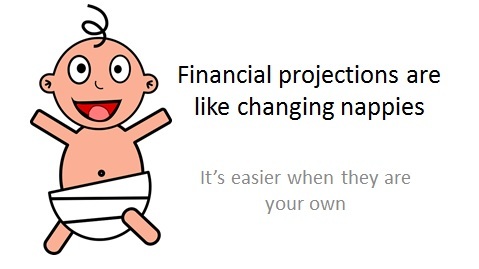 I have developed a financial projections workshop for startups and SMEs. It is a most challenging area for most startup promoters as many will lack an accountancy or finance background. There can be a genuine reluctance and fear to engage with creating financial projections. But entrepreneurs can learn so much about their business from going through the process of creating financial projections (it is a key step in feasibility studies). With the right approach, I find that most entrepreneurs can be convinced to roll up the sleeves to create financial projections when this work is for their own business – as per graphic below! As the expert in an area, the freelancer’s role is both as a teacher and a business advisor. As a trainer one needs a solid training methodology to facilitate the client to learn. One also needs patience. It is very important to acknowledge their real concerns at the outset, and work at a pace that suits the client. I find that such an approach builds trust and confidence. A key issue at this juncture, is to decide if you can indeed provide a solution. If not, it is time to refer the potential client to someone who can. Most startup entrepreneurs work alone, as in they take the big decisions on their own. When someone takes their side, and adopts an approach of ‘jointly assessing the situation’, this is greatly appreciated. This is equally true in a situation where one is meeting two or even three co-founders. I see this in my own clients. I also see it with participants on programmes such as New Frontiers and StartLab – the Managers act in the best interest of the participants and develop a great bond of trust and respect. My experience in providing feedback on behalf of Enterprise Ireland to CSF applicants is relevant here. The scenario is that startups have applied on a competitive basis for €50,000 for 10% equity in their company. They have been informed that on this occasion they have been unsuccessful in getting to the 2nd stage which involves a pitch. The applicants are given a time when they will be given feedback on their application in a 15 minute call. We generally make up to ten calls in succession in a half day. I find that the calls are in general hugely positive. During the evaluation stage, time is taken to provide feedback on the scores given across the set criteria – these are published on the EI website. During the call I will read out the feedback. I will also ask two questions. I generally ask what the applicant thinks of the feedback; and has anything changed that would change the feedback the next time. Most people agree with the feedback and most have made progress in their startup journey. This makes for a positive experience. On other calls, the conclusion is that the nature of the business means it is not a suitable fit for CSF – it is a competitive process. When applicants are able to draw this conclusion for themselves, this can provide a type of closure that applicants appreciate. It means that they can set an appropriate path for the business. I make a point at the outset of explaining that I don’t work for EI but for CSF I work with them. I am trying to set the tone that on the call, ‘we’ are trying to jointly assess the situation. 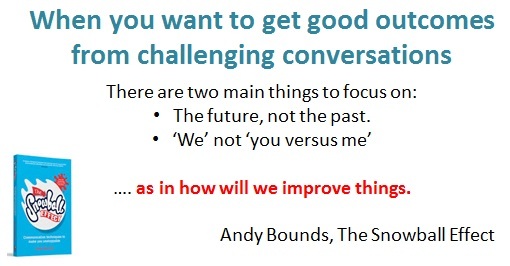 By happy coincidence, as I was finalising this post, I read chapter 55 of Andy Bounds’ The Snowball Effect on the topic of ‘challenging conversations’. The follow on step is to help the client to devise a solution or create a plan to tackle the issue. It is critical that the person is fully involved in the creation of the plan and fully understands the principles underlying the plan. A plan which is imposed or simply given to a client has less chance of being implemented. This step could be titled ‘Give Control back to the Client’ because that is what I try to do. The likelihood is that some customers are not in control of their emotions or their business when you meet them first. I find that I take ‘control’ of our process of engagement in those situations. 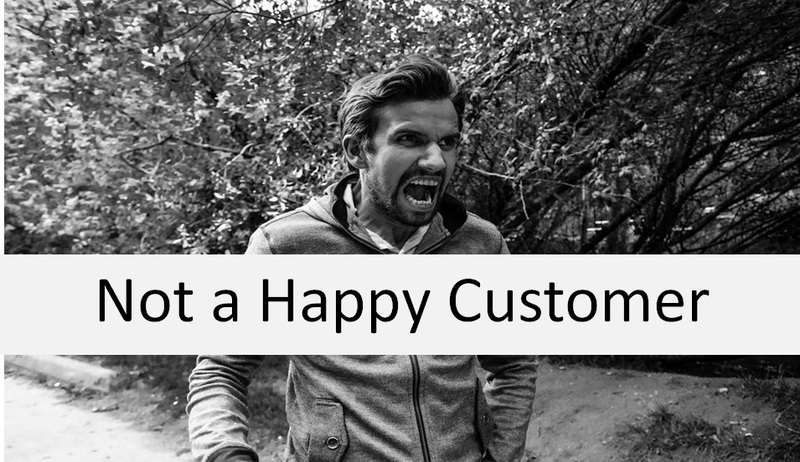 When one thinks of difficult customers, one will probably think of emotional outbursts and unreasonable behaviour. Extreme misbehavior can not be tolerated, but sometimes a customer needs space to vent (or even to cry). Most people agree that emotions should not be repressed. And as I mentioned above, most startups founders/ co-founders work alone. So it is extremely useful to have someone who they can be totally honest with. Ground rules can then be established- emotions must be constructive. The second area where startups may not be in control is their business. The startup world is full of contradiction and confusion. It is very easy to get caught up in the detail of the business and not see the big picture. It is equally easy to get overwhelmed by the big picture and be paralyzed into a state of inaction. This affects even experienced business people never mind people emerging from engineering or software development with limited business expertise and acumen. This is why I am such an Advocate of Lean Startup. This is the principle that assumptions should be created, and then tested in the market, before changes can be made to the business. This thinking can be applied to all elements of the business not just product development. When advice or guidance is not taken on board, it is important to not take it personally. Ask them to consider the evidence ie to undertake some market tests and to base their decisions on the evidence. After all it is not the job of advisors to make decisions but to assist the entrepreneur to devise a plan. A critical step in devising such a plan is to consider all the options. This ideally should involve learning from the experience of other businesses – which I can share with startups during our discussions. By following this approach, I am hoping to transfer a process for decision making to the client. This is handing them back control. I think that this is a process of developing self awareness. Build trust, be honest and engage in open communication. Provide value! Then you can ask to be paid. You should also have a relationship that allows you to chase your customers for payment – going back to the earlier point that people are intrinsically good, they are not delaying payment to cause undue harm but they are under pressure themselves. It is often said that the Customer is always right. I don’t necessarily agree with this – it is not a universal truth. I would add that oftentimes there is no right or wrong, just an opportunity to put things right. As such it is important that the customer is placed at the centre of the solution and that every effort is made to deliver a package that solves their issue, in its many dimensions. As always, I hope you enjoyed this post. Comments and shares on social media welcome.